Goal: Teach your teen to consistently start, stop, and turn smoothly with full vehicle control. Everyone in the vehicle must be properly buckled up. Before starting, coach your teen to always signal and check mirrors and blind spots before changing the speed, position, or direction of the car. Remind them when needed. Have your teen drive around the perimeter of the lot several times at a slow speed. Have them stop and start frequently, practicing smooth hand-to-hand steering, braking, and accelerating. Pick several targets in the large, level, empty practice area, and have your teen drive to them at specific speeds. For example, “Drive to the stop sign at 15 mph.” Focus on steady speed and smooth starts and stops. Once your teen is braking smoothly, practice “hard, smooth stops” at slightly higher speeds (approximately 25–30 mph). Hint: Curling toes back just before braking results in smoother stops. It eases the pressure on the brake. Ease off the accelerator or use the brake to reduce speed before entering a curve; use gentle acceleration to overcome inertia and pull the vehicle out of the curve. 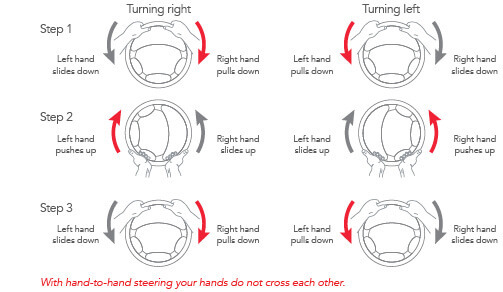 Use smooth, continuous steering wheel movements when approaching a turn and when returning (sliding) the wheel through the hands until the vehicle is in the proper post-turn position. Coach your teen to pick a target near the center of the intended travel path. This target can be used as a visual aid to aim at while steering through turns. New drivers tend to use the brake too much and the accelerator too little to control speed. Coach your teen about easing up on the gas pedal as a way to reduce the car’s speed.